widespread and unquestioning focus on milk as a source of protein and calcium, assisting in the prevention of osteoporosis and in the strengthening of bones in children, has led to the growth of allergies to milk (or rather to the lactose it contains). Paradoxically, factory produced milk actually hinders the absorption of calcium, resulting in multitudes of asthmatics resulting from the production of a harmful mucus in the body (AME), as well as causing brittle bones. Few people know that UHT milk contains minuscule particles that penetrate cell membranes and which cause inflammation, leading to allergies, atherosclerosis and heart disease. Bring 1 cup of cow or goat’s milk to the boil with 1/8 teaspoon turmeric, boil for 3-5 minutes. Let stand and strain. After cooling sweeten with honey to taste. For variety, add cinnamon, cardamom or ginger according to taste. Make a paste from turmeric powder by heating with a little water for 8 minutes (can be refrigerated for up to a month). Then add 1-2 teaspoons of hot milk (you can use soya) and sweeten with honey. 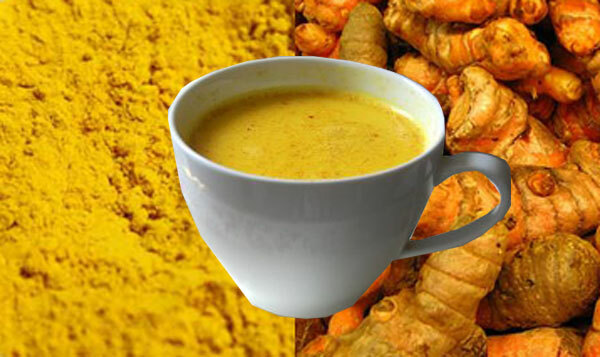 The colour, smell and texture of golden milk acts like a balm for the senses. It is recommended especially in states of exhaustion, stress, insomnia, or during a cold (it works much like milk and garlic, popular in Poland, but is so much better!). In the case of constipation, you can add a teaspoon of ghee. I know many people who simply cannot imagine an this post evening meal ritual ;). Alternative sources of calcium (for those milk lovers upset so far!) are almonds, salmon, tofu, broccoli, sardines, beans, sunflower seeds and chickpeas. This entry was posted on February 11, 2013 at 3:09 pm and is filed under Ayurveda, Food- the rules. You can follow any responses to this entry through the RSS 2.0 feed. You can leave a response, or trackback from your own site. Hi !! Thank you for visiting my Blog and more than that Very Happy to read from you !!! Ayurveda it is One of My Highest Interest and always Reccomend to my patients and using my self a lots of Recipes !!! Ayurveda it is the key to the Healing and even in Cosmetics Practice so many uses and so efficient !!! I am working to open the door more and fr people to get more informed !!! Lots of people here in North America are very dependents on Drugs !!!! It is a need of Education , for a New Understanding of the Global Means of Healing !!!! Ayurveda it is the ” Great Medicine ” and first think people may have to look for before jumping to Drugs who are only creating other diseases !!!! Have a Great Day and very Grateful for ” meeting ” You !!! Best Regards !